"Central High School, a Tudor-Gothic Revival building, was built in 1917 on the corner of Sixth Street and Cincinnati Avenue. ... Fresh drinking water, pumped and filtered from deep wells, could be found at the school's drinking fountains. 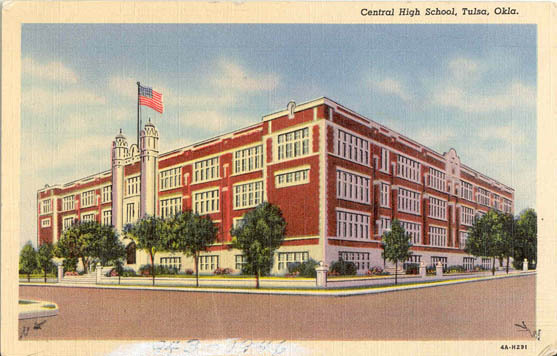 Central High School was Tulsa's primary high school until the 1930s, when Will Rogers High School at 3909 East 5th Place, and Daniel Webster High School at 1919 West 40th Street were constructed. In 1976, Central High School was closed. The school was reopened in a new building at 3101 West Edison Street. The Public Service Company of Oklahoma, a public utility company, is now housed in the building once occupied by the old Central High School."